Savvy Spending: Kroger: Free Yoplait Greek Yogurt coupon! Clip today, use by 1/31! 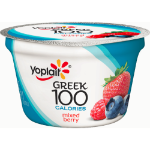 Kroger: Free Yoplait Greek Yogurt coupon! Clip today, use by 1/31! Today, 1/15 only,you can download a digital coupon to your Kroger Savings Card for a FREE (1) Yoplait Greek Yogurt (4.5-5 oz). You must clip the coupon today, but it's valid through 1/31/16 to redeem.